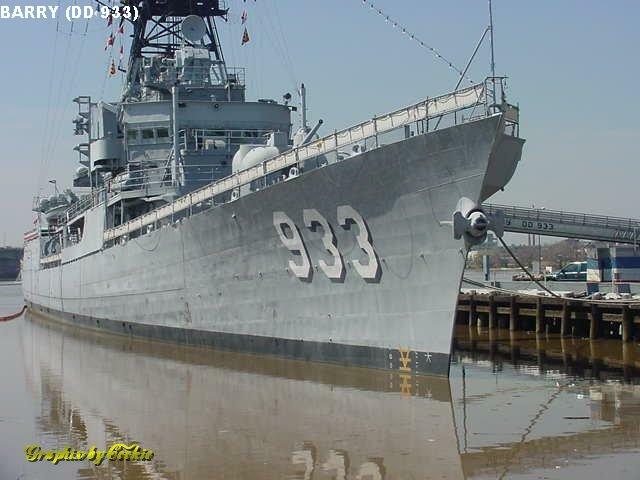 USS Barry (DD 933) was one of 18 Forrest Sherman class destroyers constructed in 1955-1959. The Forrest Shermans were the first US destroyers of entirely post-WWII design, and were intended as a "mobilization" design - simple and easily constructed for wartime mass-production shipbuilding. 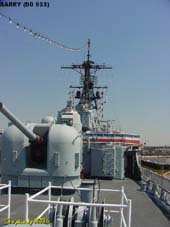 They were armed with three 5"/54cal DP guns, two dual 3"/50cal AA guns, four 21" torpedo tubes, two Hedgehog launchers, and dual depth charge racks. 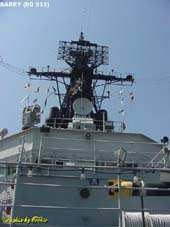 As time went on these weapons became obsolete, and several of the ships were modernized - four became guided missile destroyers (DDGs), and eight, including Barry, received an ASW modernization. 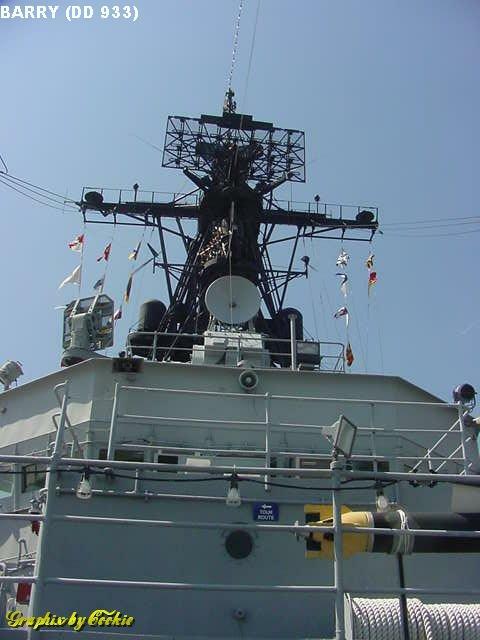 The ASW-modernized ships traded one of the 5" guns for an ASROC launcher, received a towed variable-depth sonar, and underwent general modernization. 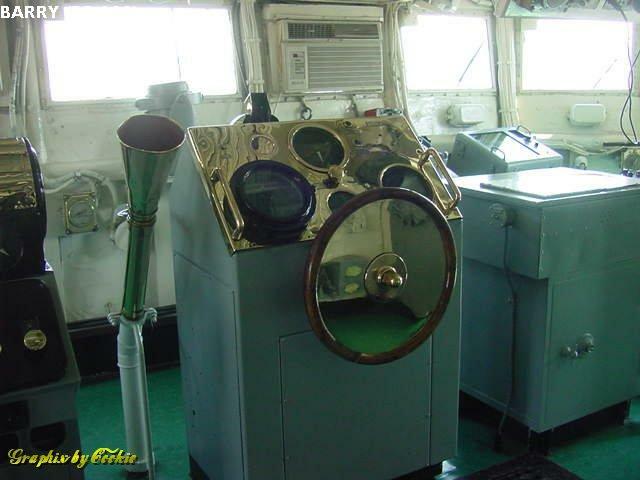 The 3" guns, 21" torpedo tubes, Hedgehogs, and DC racks were all removed over the years as well. 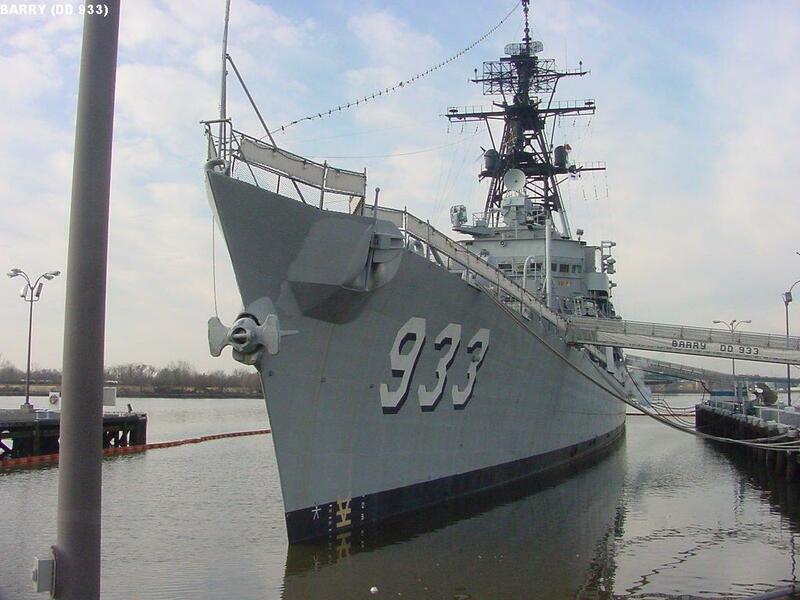 Barry was built by Bath Iron Works as that yard's hull number 326. 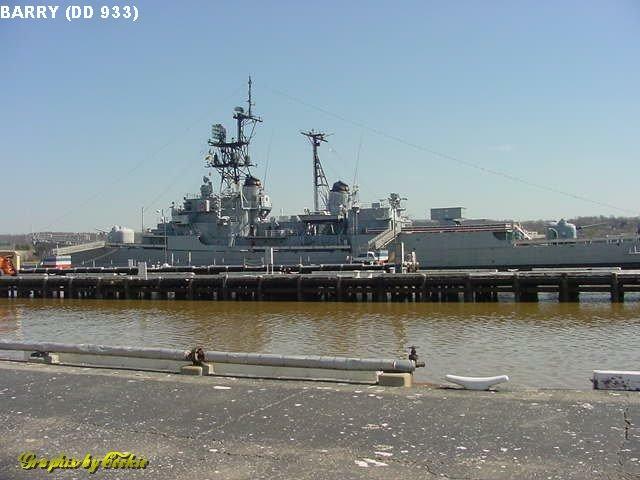 She was laid down 15 March 1954, launched 1 October 1955, and delivered and commissioned 31 August 1956. 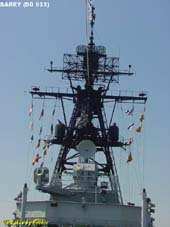 After nearly 30 years of service to the country, she was decommissioned 5 November 1982 and stricken from the Naval Vessels Register 31 January 1983. 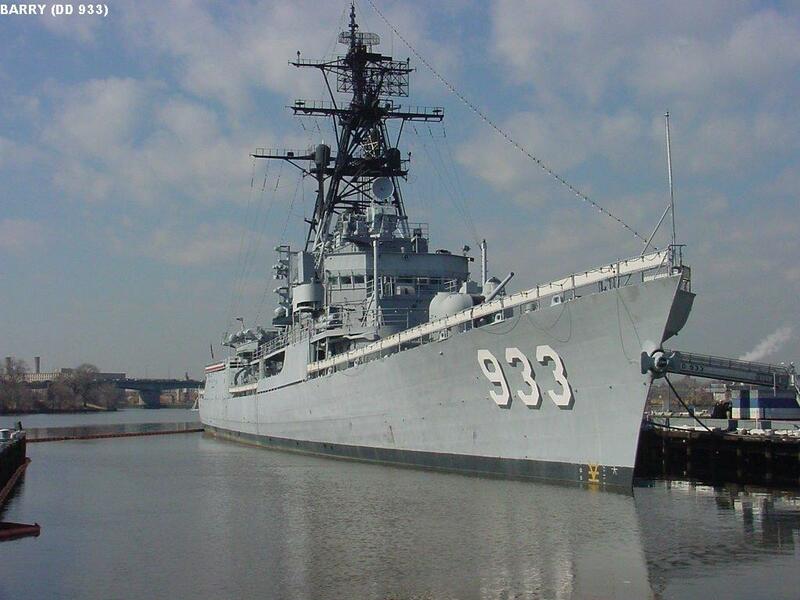 Although most of her sisters were disposed of, Barry was moved to the Washington Navy Yard and became a museum there. She has continued in this service ever since. 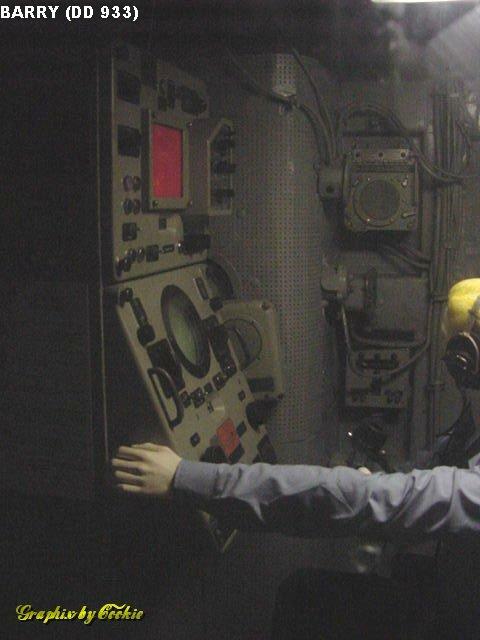 In 2000 Barry developed a leak, which flooded a tank and caused her to list several degrees. 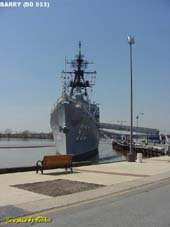 The list was soon corrected, but further inspections revealed her hull was in poor condition and would require significant repairs. 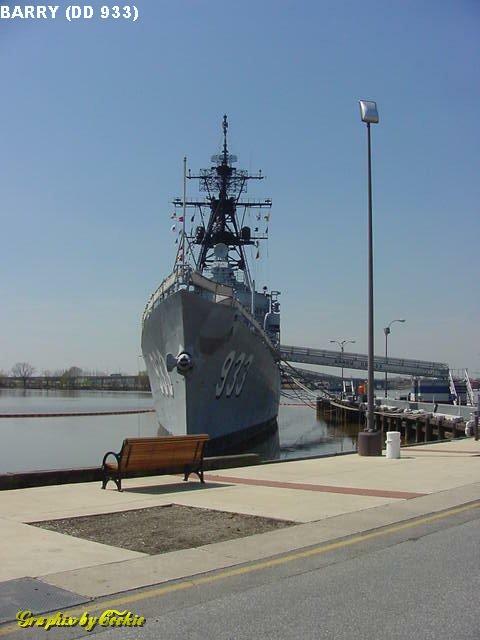 Although for a while it was rumored Barry might be disposed of and replaced by a newer ship, the latest unofficial information indicates she will be repaired and will remain as a museum at the Washington Navy Yard. 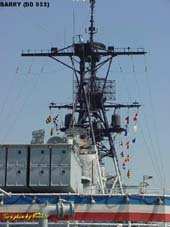 A closer view of the starboard bow. Bow-on view, slightly to port. 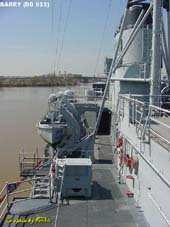 A port bow view of Barry. A port broadside view. 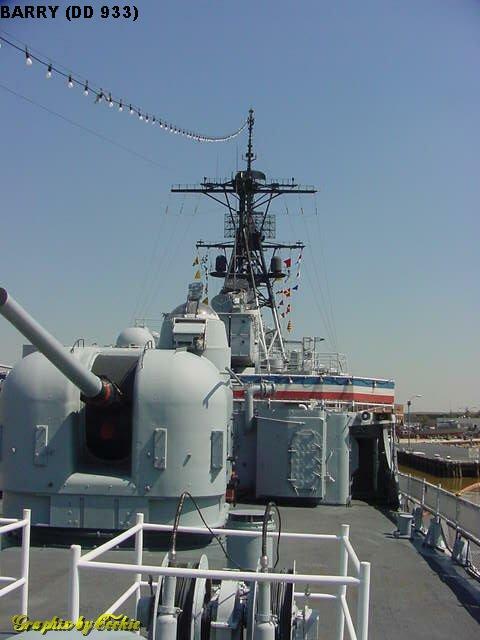 This view shows all the ship's major weaponry: 5"/54cal guns fore and aft, and an 8-cell ASROC launcher aft. 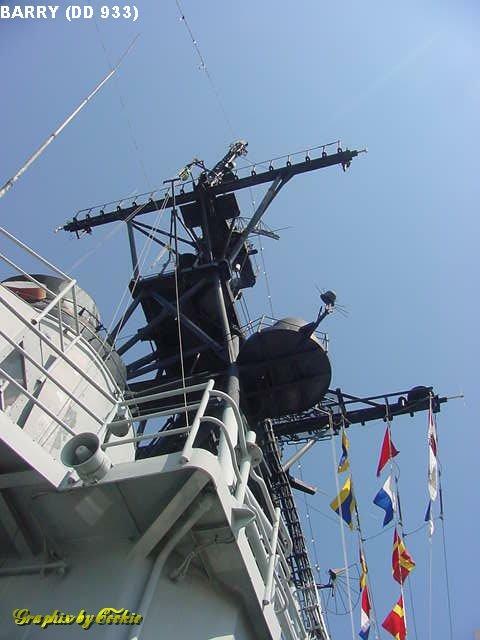 The ASROC replaced a third 5" gun previously installed in this location. 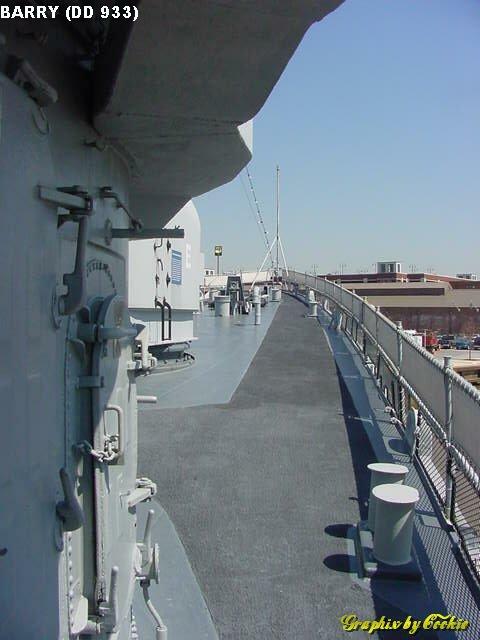 View looking up towards the bow, along the starboard side. Centerline view up the bow, over the anchor gear. 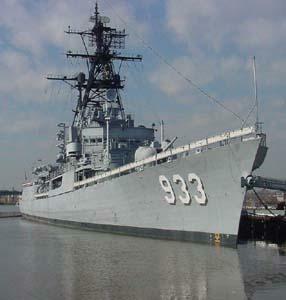 Barry was the only member of her class refitted with a bow-mounted sonar dome, resulting in a unique arrangement of her anchors. 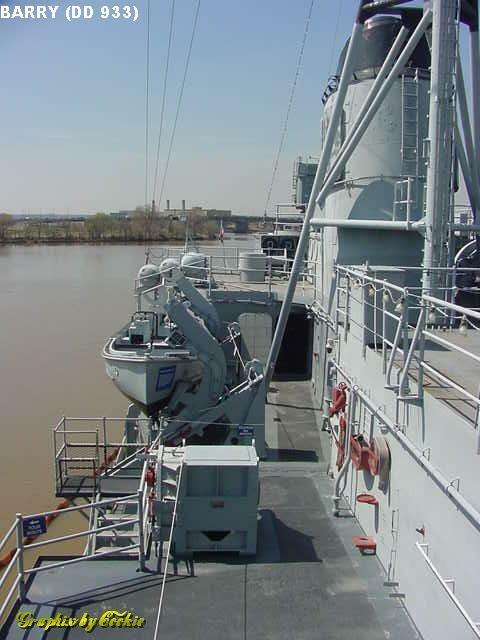 The original starboard-side anchor was removed and replaced by a centerline anchor, while the port anchor was bulged out from the side of the ship. 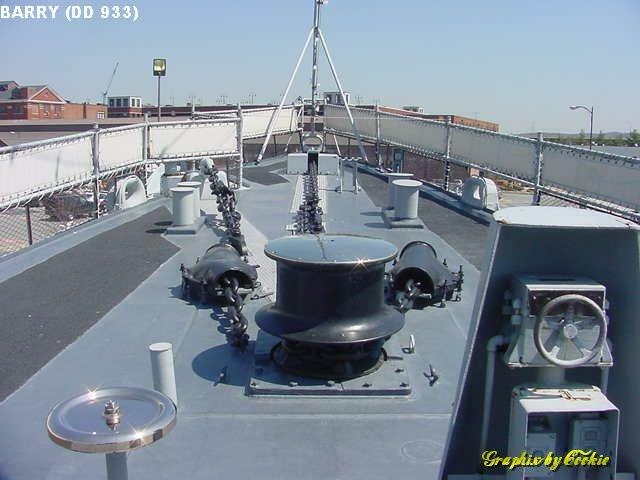 View from the bow across the 5" gun to the bridge and mast. 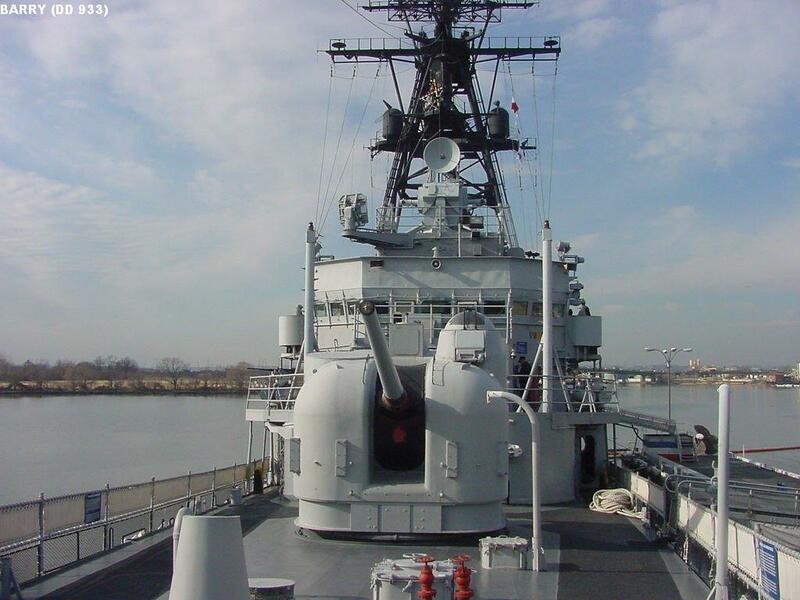 There was previously a dual 3"/50cal gun mount on the 01 level, just ahead of the bridge. 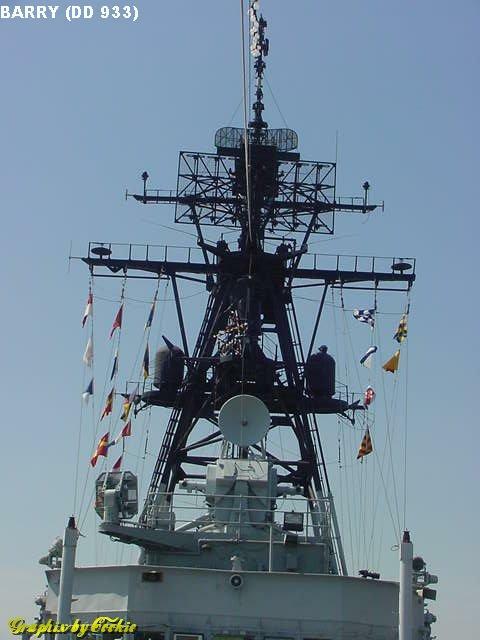 A view up the face of the bridge and up the mast. A closeup view of the mast and gun director atop the bridge. 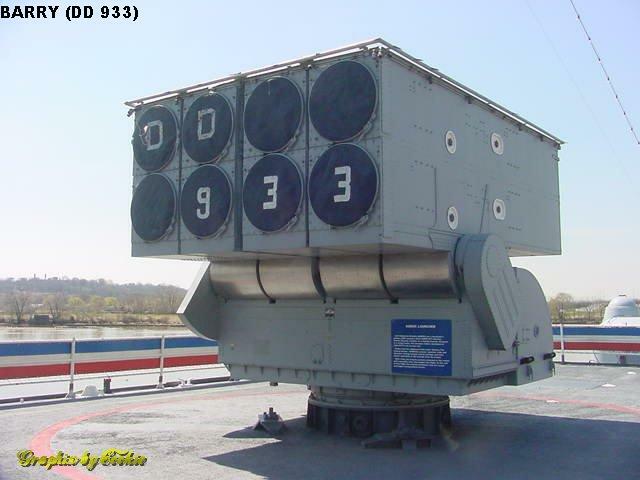 The large radar is the SPS-37 air search, with the small SPS-10 surface search above. 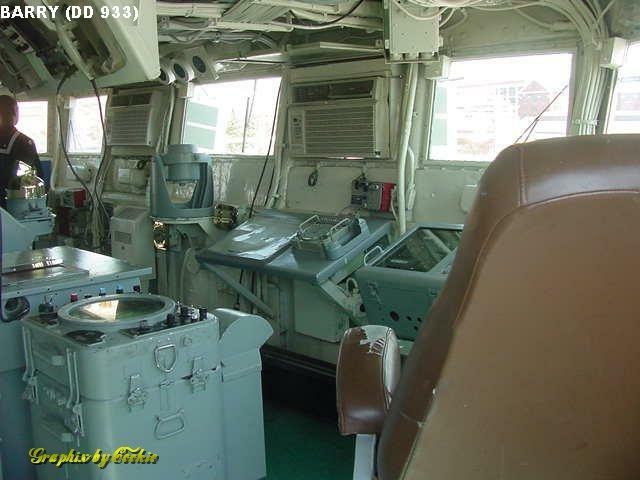 View from aft, along the starboard side, past the 5" gun and ASROC towards the masts. 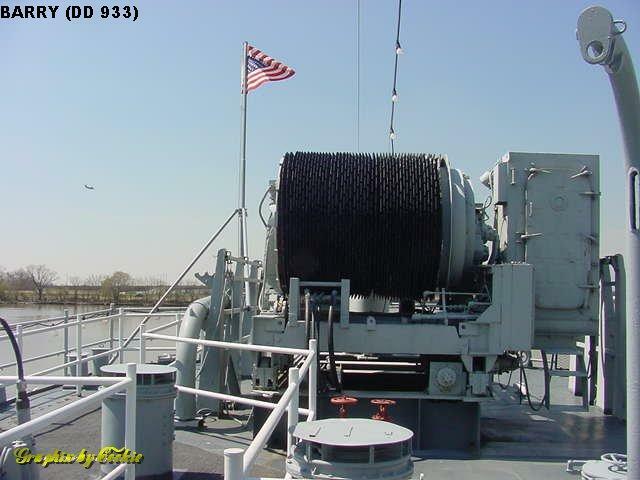 The small winch in the foreground is the T-Mk6 Fanfare towed torpedo decoy, predecessor to today's SLQ-25 Nixie. 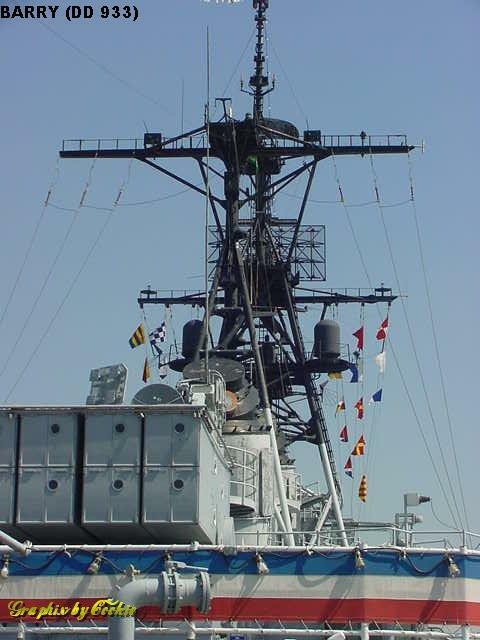 A closer view of the ASROC box launcher, stacks, and masts. View looking up the foremast and forward stack. 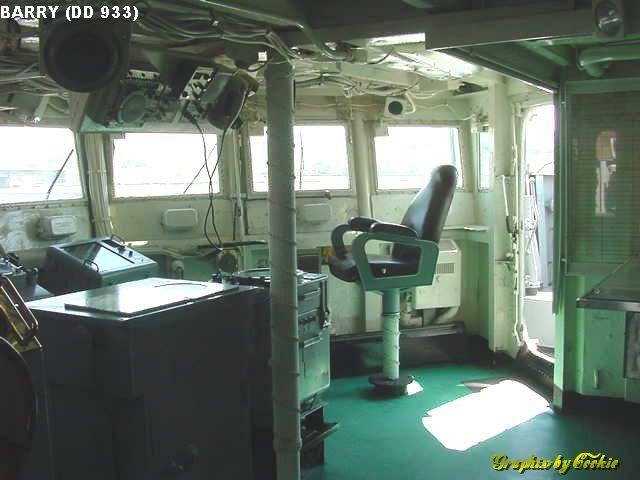 A view from the bridge, looking aft along the starboard side. 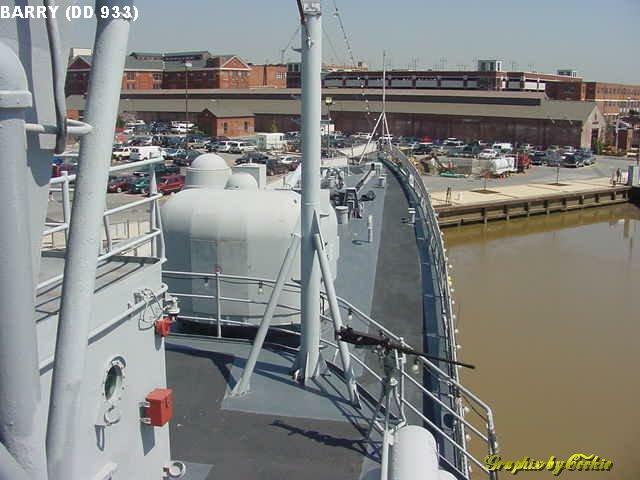 Looking forward from the bridge across the forecastle, into the Washington Navy Yard. 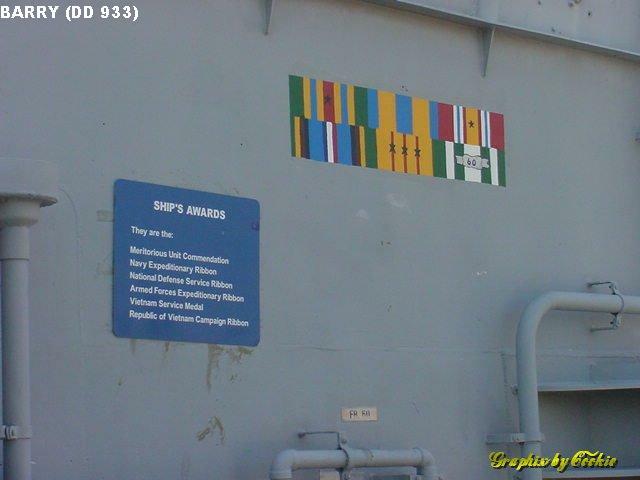 The ship's awards on the forward deckhouse. The awards are: Meritorious Unit Commendation, Navy Expeditionary Ribbon, National Defense Service Ribbon, Armed Forces Expeditionary Ribbon, Vietnam Service Medal, and Republic of Vietnam Campaign Ribbon. 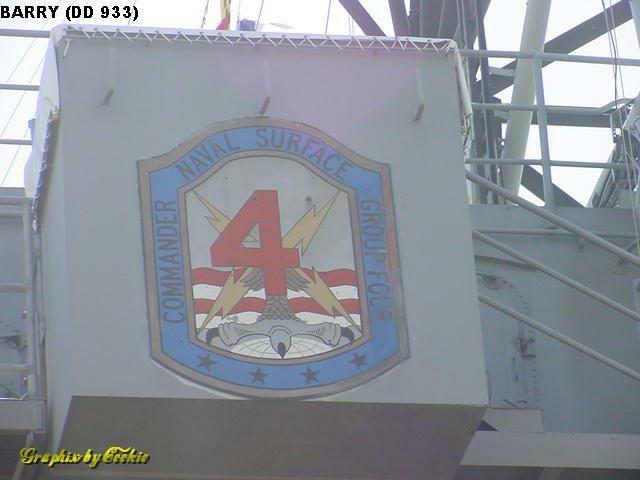 The COMNAVSURFGRU Four seal is painted on the superstructure. A closeup view of the ASROC launcher, looking aft. 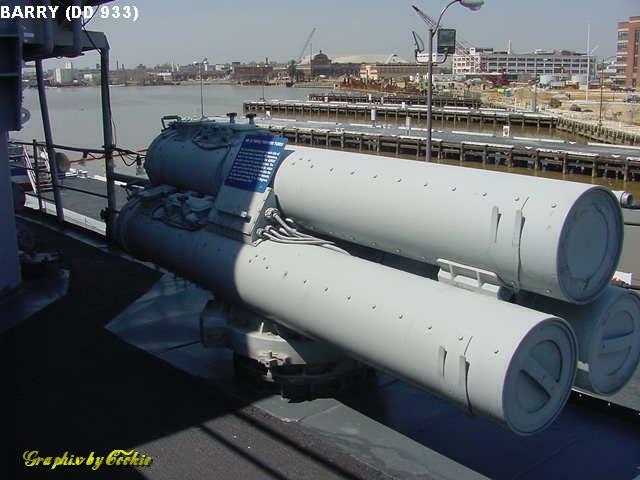 Barry also carries the standard pair of triple 12.75" torpedo tubes for lightweight ASW torpedoes. The winch for the SQS-35 IVDS towed sonar is mounted at the stern. View of the bridge, looking forward and to port. The two air conditioners in the forward windows are not original equipment. Reverse view of the bridge, looking to starboard. 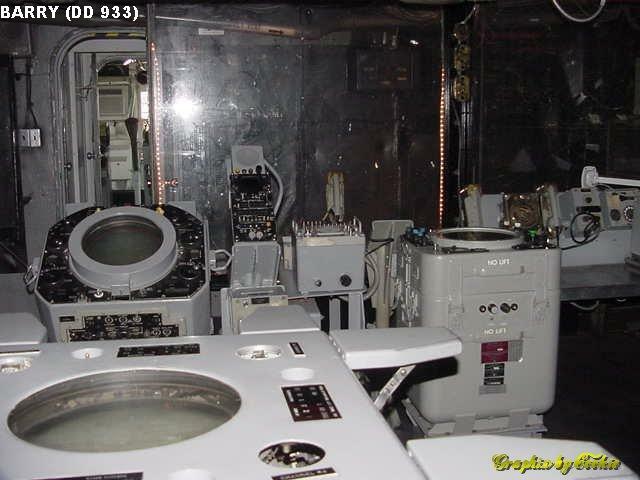 A view from the ship's CIC, out through a door to the bridge. 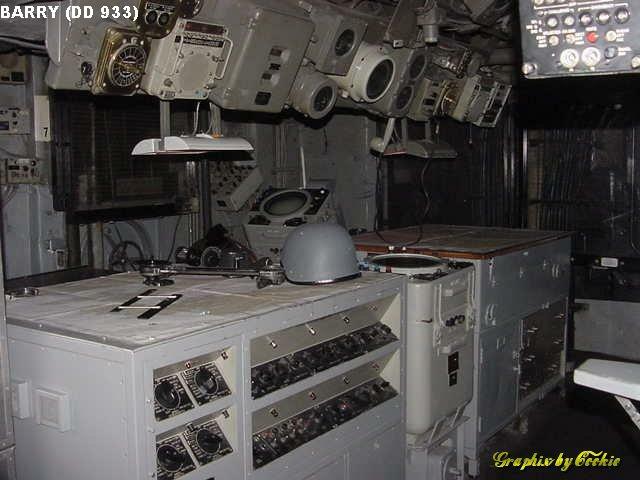 The electronics consoles have also been restored and supplied with dummy "operators". 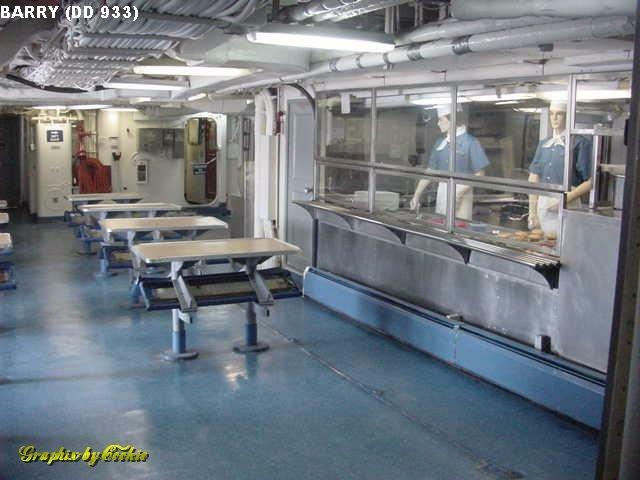 Various below-decks spaces have also been restored - this is a crew berthing area. 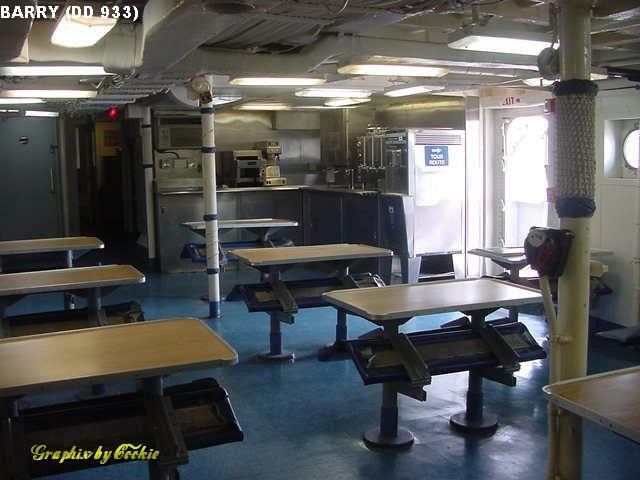 A view of the crew's mess and galley. 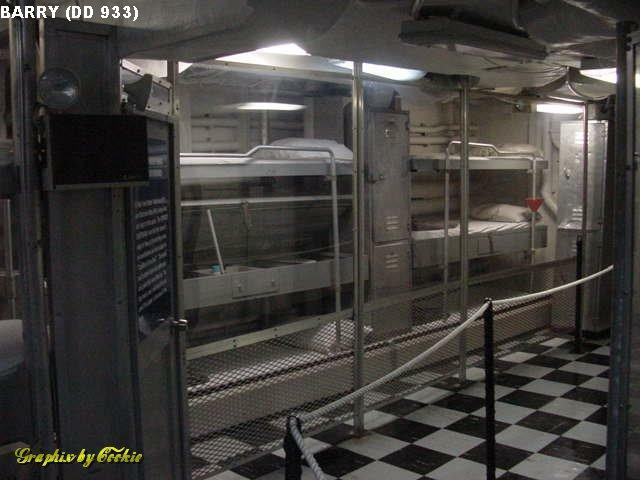 Another view of crew's mess.